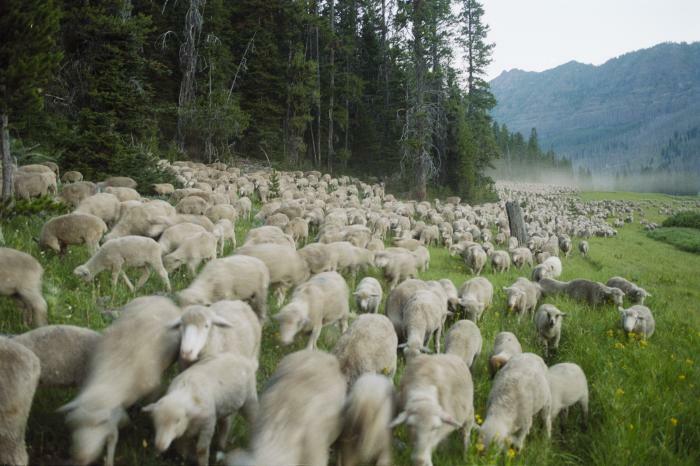 In 2003, married filmmakers Barbash and Castaing-Taylor recorded the last traditional sheep run in the American West. This 150-mile round-trip trek in Montana’s Beartooth mountain range, by turns idyllic and treacherous, was conducted by the Allesteds, an old-school ranching family that time is about to pass by. And time is a central issue here. “Sweetgrass” is a patient, immersive and exceptionally handsome film about 21st century people plying an ancient trade in communion with animals and the natural world. Without the distractions of narration or musical soundtrack, the sight of stoical cowboys and their sheepdogs striving to keep their immense flock in line on their way to summer pasture feels like a much-needed re-calibration of a frantic and over-technologized world. The directors (who also hold positions at Harvard University in anthropology-related departments) have fashioned a work that can stand with 1925’s seminal Merian Cooper/Ernest Schoedsack documentary “Grass”, as well as with the observational classics of Frederick Wiseman. Did you ever wonder what it’s like to slosh around in bilge water on the killing floor of a large trawler, eyeball to eyeball with dead and dying fish? Then, man, do I have a motion picture for you. It turns out that Castaing-Taylor’s next film (and the first under the auspices of his Sensory Ethnography Lab at Harvard) was a narrative-free trip on an unnamed commercial fishing boat released earlier this year to generally admiring reviews. “Leviathan”, like “Sweetgrass” before it, is an immersive experience but one that is a little more difficult to appreciate (the rhetorical question above will give you some idea why). Outside of the fact that the viewer will realize that he or she is watching the operation of a commercial fishing vessel, there is little context to the film. This is the general idea, of course. According to the SEL’s website, the lab’s purpose is to promote “innovative combinations of aesthetics and ethnography that deploy original media practices to explore the bodily praxis and affective fabric of human and animal existence.” Well, fair enough I suppose. I appreciate the rigorous aesthetic employed here and in interviews Castaing-Taylor and co-director Verena Paravel are earnest and deserving of admiration for their keen understanding of their subject matter. (Their implicit sympathies with the ship’s crew recalls 1929’s “The Drifters” by pioneering documentarian John Grierson, whose deep respect for his working-class subjects—also fishermen—was novel at the time). But context counts for a lot in the mind of an average viewer; without it a film like “Leviathan” can be misconstrued as merely a technical exercise. One can only gape in amazement at some of the photographic techniques on display here. 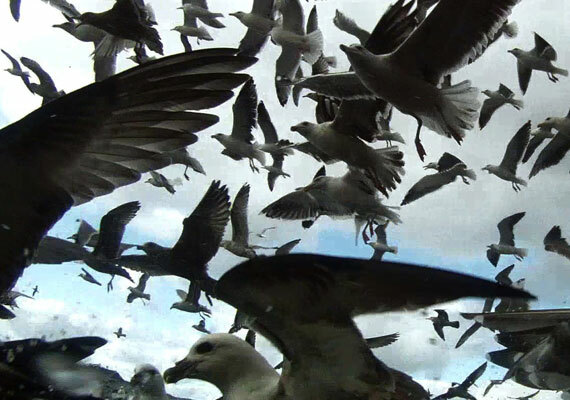 The best bits involve some sort of bobbing camera (likely a small consumer model) that is often dunked under the ocean waves, occasionally getting pulled back up to reveal frantic flocks of gulls or the wedge of the ship’s bow plowing straight at you. But the first twenty minutes of the film are naturalistic to the point of distraction. OK, you can tell by the grainy unlit footage that the ship’s enormous net is being rung up, about to disgorge (any minute now!) a huge tally of luckless sea life onto the floor and the gutting and cutting will commence. But what of it? Art, like nature, abhors a vacuum and many a viewer’s mind will fill with questions about overfishing, government regulations, environmental concerns, etc. But that’s for another documentary—2009’s “The End of the Line”, perhaps. I do look forward to Castaing-Taylor’s future projects and hope he steers away from the academic echo-chamber impulses that prompted him to try and transcend (in the SEL’s words) the “purely verbal sign systems” that people seem to rely on. If not, their next film make not make it past the hallowed halls of you-know-where. Oceangoing themes popped up again recently when I checked out a Blu-ray of Stanley Kubrick’s quickly withdrawn first film “Fear and Desire”, now finally seeing a home video release. As an extra, it contains his 1954 doc “The Seafarers.” It’s a boilerplate industrial film where the sponsoring Seafarer’s International Union is presented as a magnificently generous benefactor for its seamen members, who are happy enough to live in human-scale houses and only ask for a fair shake in the workplace. This makes it almost painfully nostalgic in our tough-luck economy of six decades later. On the other hand, it’s not hard to see why Kubrick suppressed “Fear and Desire.” Though it has many early inklings of his masterful visual style, it is hopelessly hamstrung by Howard O. Sackler’s overboiled script and stilted dialogue.